I have been experimenting with my favorite cookie recipe. I wanted to try to make a cookie that had chocolate and toffee in it because I love that combination. I tried a few things and I finally came up with a really good version of a Chocolate Toffee Pecan Cookie. These cookies are so good. I sent a plate full of them to work with my husband and everyone loved them. I also served them to some friends last week and they all liked them. I had trouble not eating them, they are so good. If you like chocolate and toffee give these a try. These cookies are large cookies. They are made to be like a cookie you would be in a coffee shop or bakery. I have tried making them smaller and it changes the texture. You want these large. Preheat oven to 325. In a bowl, mix dry ingredient. In mixing bowl, combine butter and sugars until well blended. Add egg, yolk, and vanilla. Batter will appear slightly greasy. Add dry ingredients, until blended. Add chocolate chips, pecans, and toffee pieces. Scoop in ¼ c. balls onto cookie sheet. I use an ice cream scoop. Place 6 on each cookie sheet. You should only place 6 per sheet because these are large cookies and they spread out. Bake for 15 minutes. As soon as I saw the word cookie, I clicked on your link. I love cookies and can’t wait to try this recipe out! 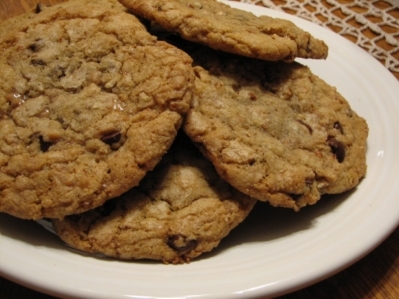 This week I am going to be baking some Oatmeal Raisin and Peanut Butter cookies and will be sharing my recipe favorites! Thanks again and have a great day! Wow, this looks fabulous. I printed it off for my daughter!! These look yummy. I’ll have to give those a try…..not right now though because I’m on a loosing weight journey and these certainly would not help and would be WAY too much temptation for me. I can’t wait to make these. I have been craving chocolate chip cookies, lately. This sounds great, and believe it or not, I have a bag of toffee bits in the pantry. Yeah me!! Thanks for sharing your well crafted and tested recipe. Love the idea of the “BIG” cookie. I am so glad you participate in TMTT! Oh my goodness those looks so delicious! I wish I wasn’t still tyring to lose baby weight:)! My hubs loves all things toffee so I will have to make these for him as a surprise. Oh my! Thanks for sharing — I’m bookmarking this page! How many cookies does this make? I want to make enough the first time in case I’m not in the mood to share very many….. It makes about 15 large cookies. I use my ice cream scoop to scoop these. I guess I should have mentioned that. It is a little over 1/4 cup. But I think around 15 is what I get. I do usually double it because I give them away or freeze them. I LOVE cookies and need to make some for a shower this week… guess what just went on my shopping list… toffee! Mmmm! Those look great! Thanks for the recipe. The clouds just parted, rays of sunshine came down and the angels are singing … this looks and sounds devine!! I love anything and everything that has chocolate, toffee and pecans in it!!! If you can’t find it, my chocolate post this week (chocolate cake conniption) contains a link to it. Thanks for linking up! This recipe sounds so yummy – I love that combination. And yay for big cookies! MMmmmmmmmm, what a great combination!! Will have to make these! Lynn – I have a quesion about these cookies. Could you shoot me an e0mail telling me just exactly what you’re using as “English Toffee Bits”. Is this something yo buy? or something you break up from something bigger. Where do you get it? I love your blog, and read it every day………. @Clairee, I use the heath english toffee bits found at the grocery store on the same aisle as the chocolate chips.